Often when we talk about the value of sleepaway camp for our kids, we point to the gift of being immersed in nature, away from screens. But there are so many other things plaguing us right now than the latest social media app or the newest addictive video game. Between the bitter partisanship of our government, the increasing acts of anti-Semitism and intolerance, and the new normal of gun violence, it’s easy to feel disheartened and fatigued by the state of things. If only more of us learned the core lessons taught at sleepaway camp, I believe we would experience and observe less of the conflict, racism, and selfishness that exists today. At Camp Walt Whitman, campers learn basic respect for their fellow human beings. One of the few rules we have at camp is that everyone must be respectful of all other members of our camp community. This applies to fellow campers, counselors, cleaning staff, kitchen staff, everyone. We don’t expect everyone to become best friends, but each person is deserving of respect simply because they are human. It’s the only way our camp community can work and thrive. Campers also learn to get along with people who may be different or from different parts of the world. Spending 7 weeks living in close quarters in a cabin of 8 to 10 campers requires that a person, no matter how young, finds and appreciates the best in others and learns to tolerate the idiosyncrasies and differences we all possess. A cabin may have campers from New York, Boston, Florida, California, and Texas; campers who are quiet; campers who are outgoing and thrive in big groups; others who like one-on-one connection. Tolerance and flexibility isn’t an option; it’s a must. Here at Walt Whitman, cabin mates travel together from activity to activity, so campers see these differences in action, too. Some campers may excel at very different activities than others do, and as the group tries new things, they discover that someone may be great at soccer, another excels at tennis, one is a natural at the theater, the other great at swimming. Just as importantly, one of their cabin mates may not be great at anything, but is just a really nice kid, which, as everyone learns, is the true social currency of camp. Realizing that you are part of a bigger world and that part of your responsibility is to give of yourself to others is another big lesson at camp. This can be as simple and small as helping a friend make their bed so that the cabin has the best chance of getting a high score during inspection (with the goal of winning the golden toilet brush award!). Or maybe it’s taking the rotating responsibility of being the clearer or sponger in the dining hall or recognizing that not all children are lucky enough to go to camp. Walt Whitman campers participate in a 5K Fun Run to raise money for Project Morry so that underserved children have the chance to experience a sleepaway camp and thrive in a camp environment as our campers do. At sleepaway camp, we learn how to overcome obstacles and challenges in a productive, positive way. If campers are upset with someone or if someone says something that hurts their feelings, they learn to engage in a productive conversation with the person to solve the problem. Counselors of course help with this. But rather than stay upset or send a text message, as one might do back home to friends to complain about how horrible so and so is, campers learn to have difficult conversations that lead to positive resolutions—face-to-face, without their phones. The importance of integrity, and what it means to give your word and commit to something when others are counting on you is another value that campers take away with them. A cabin that is hiking together or on the ropes course together needs to know that people say what they mean and do what they say. Things can definitely go wrong and mistakes happen, but not mistakes resulting from dishonesty. In close group quarters, trust is required. Campers learn they can’t always get everything they want; instead, they learn to compromise and advocate for themselves. Living in a cabin means learning how to work together. For instance, campers choose what their Bunk Night activity is going to be once a week. Since the whole group must decide together (with the counselor’s assistance), this can be a challenging process. Different people have varying ideas of what would be fun to do as a group and everyone has thoughts on the idea that they think is best. But ultimately the group learns they have to listen to each other, have some give and take, compromise and recognize that sometimes other people get their wishes even if it’s not everyone’s first choice. Finally, at sleepaway camp, you learn that sometimes you have to put the needs of others before your own. Being at camp means often having to respect other people’s wants and needs even when these occasionally veer from your own desires. By no means does this mean letting others get their way all the time or not standing up for yourself; to the contrary, we encourage campers to be assertive. But in order for the group to thrive in the communal setting of camp, you learn you can’t always get everything you want. A few examples: Being quiet at night when others are trying to sleep even when you want to talk to your friends; let someone else have the final cookie on the tray; sharing a water bottle on a hike because someone else’s spilled; giving someone else the lead role in a campfire skit because it’s important to them even though you also want it; having a nightlight in the cabin because it’s important to another child even though some kids prefer no light at all; passing the ball to someone else to take the last shot in a tied game even though you really want to score; helping a friend get their harness on even if it means you won’t be first in line to go on the ropes course; or, god forbid, plunging the toilet because someone has to do it. 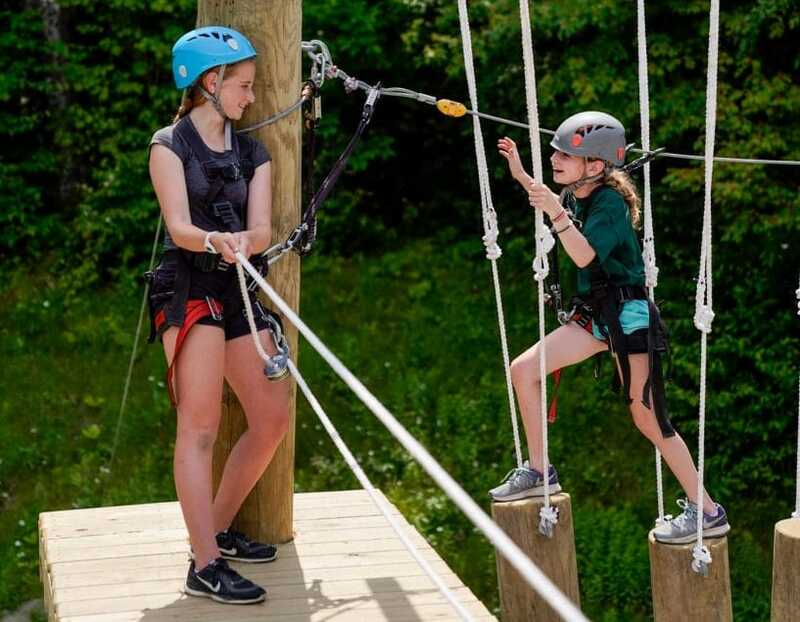 In truth, these are just a few of the ways campers learn to empathize, compromise and resolve conflicts by spending a summer away from home, in a community that is deeply invested in their growth. Now if only the world’s leaders could spend a summer at camp. We’ve got room for a few!